Die Notizen meiner Radreise von Deutschland nach Singapur sind wieder online! :) Damals 2009. I decided to go to Cambodia, the country that I visited more than ten times in the past, mostly because each time, it felt too short. This time I want to stay longer. I want to take more time to understand and explore the culture. And I want to know if I can spark some DevOps Love and see if my Continuous Delivery fu works in a totally foreign mentality. During my preparations I did some research about the current status of ‘DevOps’ and ‘Continuous Delivery’ in Asia. I got answers like ‘don’t expect too much … they are 10 years behind Europe … DevOps simply does not exist here … DevOps does not work in the asian culture’. I was instantly hooked and wanted to try it: What if it works just a little bit? What happens when I introduce concepts which are challenging even in my home country to a complete foreign culture? Once I had this idea in my mind I had to find it out. And besides all the technical challenges I was looking forward to meet old and new friends which I’ve met on my previous visits. Below are some of the key moments I experienced. Feb 2014 - Bye bye Hamburg! I leave beautiful Hamburg after one and a half years. Wonderful years. You may know that I prefer to travel light. Thus I get rid of all my inventory and keep only a minimum, mostly books, cloths and my bike Rondolf. During the weekends people come and go to pick up my belongings. I give away most of my stuff for free rather than throwing it away. Then I say ‘Tschuess!’ to my friends, to an awesome team, to my colleagues I had the pleassure to work with, to my friendly neightbors and a very beautiful City. One day before my flight to Bangkok I give a Workshop at OOP in Munich with my amazing colleague Michael. The workshop is fully booked. We have great fun. Everything works perfect. THANK YOU Michael for this great experience! During the flight: Nice chat with my neightbour about DevOps and Continuous Delivery. Coincidence? I feel supported and connected - worldwide. Arival in Bangkok feels like coming home. I prepare my talk for FOSSASIA while I sweat and enjoy every drop. Then I decide to ride to Cambodia … by bicycle! During the boring ride I freeze and shiver for first time ever in Asia! Luckily I meet old friends on the way and warm up while having good conversations. Thanks! Shortly after the Thai border the clouds break up and I feel warm and welcome. I arrive in Phnom Penh and stumble directly into the first BBQ. There I meet old friends. Cheer here and there. And finally arrive. Highlights: Eating superb Phơ with my beloved friends for lunch. The room is very packed as I talk about Continuous Delivery - wow! It feels great to spread the word and the questions from the audience are great! The next talk about Continuous Delivery is already in the planning at the DevOps Meetup Singapore! Feels great to be back in this amazing city! Goosebumps. Visiting Singapore always reminds me of my bicicly trip where I arrived in Singapore 2010 from Germany. Meeting my colleagues from the ThoughtWorks Singapore Office is also very nice. In the evening I talk about Continuous Delivery at the DevOps Meetup Singapore. After that: Mountain Cat Durian! It’s said to be the best on earth. And I can confirm the great taste! After all the traveling and conferences I book a flight to Bali to meet friends there. The idea is to cool down a little bit before going back to Phnom Penh. The last months were pretty tight and I fancy a bit of classy Island Boogie Woogie Life. Ironically my digital equipment completely fails to work after I arrive because it is too hot. Coincidence? I find a cute little hut on the Gilis island and enjoy the nice view. I also join a Freedive-Course on Gili Trawangan. Freediving = diving with one breath. No SCUBA gears. The whole dive is basically one meditation. It starts and ends with focusing on relaxing your breath. First some sessions in the pool, than in the ocean on a line. The maximum depth during this exercise is 20 meters. It’s an amazing experience to see the deep blue and what I am capable of while doing basically nothing than relaxing. The last exercise of the course is a free dive (without a rope) in an average depth of 16 meters. I pair my dive with a big Turtle and we are flying together peacefully over colorful corall reefs. Then she gracefully turns left into the big blue while I begin my decent. Thanks to Khmer New Year I can enjoy some very silent moments. The streets are mostly empty and the city is amazingly quiet. I also love the Phnom Penh Swim Squat which meets irregularly in the infamous Phnom Penh Sports Club. Oh! And I have my first moto-ride! And a very Happy Birthday! Thanks Mary, Christoph and my guests for making this day unforgettable! At work we more and more dig into the big picture. Conflicts are quickly solved although communication remains a challenging issue. It helps a ton to translate the content into Khmer. When speaking english, try to imagine that every word is a) hardly understood, b) translated literaly. This is particulary true when speaking very elaborated ‘correct’ english. What does this mean? Run against the wall? Deliver pain? It takes some attempts to find the right words. Highly recommend to attend these kind of events. Phnom Penh is a murloch of noise and dust. Constructions and other noises everywhere. On the other hand - and that might sound paradox - it is great to be here. There is something in the air. If it is only the fact that one can resist the stress of the city. Appear to stay totally relaxed and in control during traffic peak times is possible. Things that seem impossible are now no-events. I love that. The overall usage of the word ‘but’ was quite annoying and made discussions less productive in my opinion. I understand that the speaker uses the word with no bad intention and I could easily replace it with an ‘and’ whenever I hear it. This simple trick made me peace of mind. Oh so the IT team and developers are now heading towards CD. Let’s meassure how they perform. I had to remind them that the cultural change we are talking about also includes THEM and we are all working towards that goal. This was actually the biggest nut to crack. 20-10% is technical challenge. All solved problems. We have wonderful tools for managing / provisioning our infrastructure. EVERYBODY can use them. We have wonderful tools for monitoring and reporting. All open source with very friendly and open communities. Automation is easier then ever - CI, QA and infrastructure. The biggest challenge is NOT the tools. It’s the culture. It’s the mindsets. It’s the thinking in therms of ‘their’ and ‘mine’ instead of ‘our’. To know how the other(s) experience their world around them and their inner world helped a lot e.g. through personality tests. I experience my longest stay in a foreign country in my whole life. During this time I experience massive styles of home sickness, Distraction Addiction and Noise everywhere while at the same time I start a much more Mindful Living. Thanks Raju for your support! I found inner peace and confidence and trust in my ideas - no matter how crazy they might appear. Be assured that small actions have big impacts! I like the quote from Kali Linux: “The quieter you become, the more you are able to hear [and understand].” I (try to) apply this technique as often as possible especially in Asian culture. I still love the fact how ‘being away from home’ sharpens my senses and my appreciation for my home country. With every month I stay abroad I discover more and more areas of the foreign AND my home country at the same time. I still love timezones because they make me feel humble. DevOps and Continuous Delivery are both Team-Sports. It often starts with one person that has the guts to change things or is fed up by doing things over and over. Start solo, aim to archive changes together with the team and you most probably win. Thanks to the amazing people that join me on the way! I believe in the best of each of you. If you wonder why I’m so quiet: It’s because there is SO MUCH happening! The last months have been intense, full of wonders and fantastic! I am planning more posts to describe some of the amazing things that happened this year. I wish you Merry Xmas and a Happy New Year full of wonders! From February 28 till March 2 2014 I attended FOSSAsia in Phnom Penh, Cambodia. 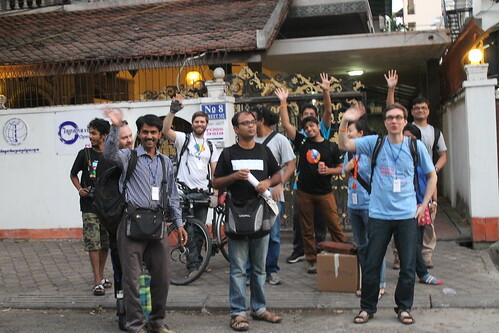 FOSSAsia is a 2 days conference plus 1 day of workshops dedicated to Free and Open Source Software held in Phnom Penh, the capital of the Kingdom of Cambodia. If your familiar with FOSDEM in Brussels, FOSSAsia is quite similar in atmosphere, just a little bit warmer with temperatures around 33°C during the days. This year over 71 international and 15 cambodian speakers shared their knowledge in 121 Talks – that is 8 full tracks per day! - with 839 participants attending from all over Asia. It all started with the speakers gathering in the Angkor International Hotel. Seing all the speakers from all over the world in one place mingle together was a special moment for me. A lot of shaking hands and cheering. FOSS craziness international. Awesome! When the event ends some of us take the chance to have another last drink(tm) in the bar area. The result: A short night with awesome talks and great fun. Feb 28: 1st Day: Grand Opening and a Full house! On Friday 28 February FOSSASIA officially started. The mainhall was very growded and I am impressed how many people actually attend. In the afternoon I give my talk about ‘Implementing Continuous Delivery’ in front of an awesome growd. The room is packed and I am amazed that so many people are interested. Although I already gave this talk several times in Europe this time is special. I am a bit concerned that my talk is too technical and that I may not be able to transport the awesomeness of the topic. My concerns are totally unnecessary. There’s no need to worry at all. I have the impression that everybody is full ears. Time flys by, we discuss a lot of interesting questions and I get very good feedback on my talk. We also manage to -improvise- play a little CD game in order to get a sense for a Delivery Pipeline and Process Automation. All in all it’s great fun and I remind my self - once again - to just relax and everything will be fine. In the evening we enjoy a nice ‘Speakers Dinner’ while cruising on the calm Tonlé Sap river by boat. There are nice talks all along. The weather is nice and calm. Khmer Disco Music plays in the background. While enjoying the scenery I drift away in thoughts about the impressions I got over the last weeks. The software scene in Asia is bigger and much more ‘alive’ than I thought. Being slightly excausted by the travels and preparations of the last weeks I oversleep and decide to rest my heated body for today. As a reminder: It’s very easy to get dehydrated - especially when wearing jeans all day long. I re-join FOSSAsia for the Social Event in the evening, catch a few good talks and (soft) drinks and then go straight into bed in order to renew some energy for tomorrows hack day. The ‘conference’ part is over. We now gather for some “sunday hacking”. Again the rooms are packed and the athmoshere is loaded with excitement. After two days in these hot conditions this is really amazing in my opinion. I’m particular interested in working on Mesh-Networks and FirefoxOS. Thus I attend Bastian Bittorf where we are setting up a Mesh-Network from scratch. He brought the routers over from Germany. After connecting the cables, updating the router OS and rebooting the devices the mesh network just works! Cool! Follow @freifunk for more updates on this exciting project. Later in the evening I join the Firefox Crew and learn how to prepare a FirefoxOS App. Thanks to Mozilla for letting me play with a FirefoxOS phone! It feels very very light (even though the one I get is a heavy one) and is intuitive to use. My iPhone instantly feels too clumsy. Looking forward to see how FirefoxOS gets adopted in the mobile market. 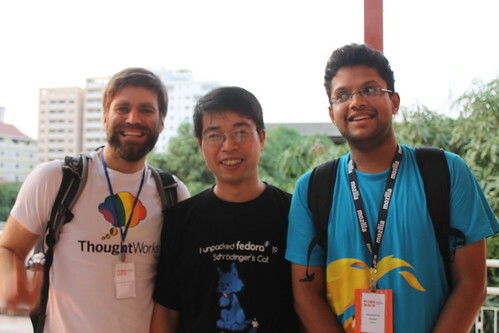 I am super proud that I could attend FOSSASIA and be a part of it. I got a slight insight of how the Asian Open Source / Hacker Community works and I definitely want to know more. Feeling the global power of open source software & collaboration at #FOSSASIA. Big thanks to Hong Phuc, Mario Behling and all helping hands that made the event so pleasant! It was a great experience and I am looking forward for the next FOSSASIA events! Diese Anleitung führt Sie durch die Installation für das Beispielprojekt zum ‘Continuous Delivery’ Workshop. Sorgen Sie für ausreichend Platz auf Ihrer Festplatte. Wir empfehlen für den Workshop mindestens 2.5GB freien Festplattenspeicher. Stellen Sie sicher, dass Ihr USB-Port funktioniert. Wir bieten das VM-Image auf einem USB-Stick an. Nun startet die Virtuelle Maschine. Verbinden Sie sich per SSH auf die Virtuelle Maschine mit vagrant ssh. Sie sind nun mit dem Benutzer vagrant angemeldet und sollten sämtliche für den Workshop relevanten Befehle ausführen können. Falls Sie sudo benötigen, können Sie ohne Passwort root Benutzer werden. git commit -m "Update content"
Bauen Sie die Applikation weiter aus und wiederholen Sie den Schritt, wenn Sie mit den Änderungen zufrieden sind. Sie können die Applikation über Ihren gewohnten Editor oder Ihre IDE auf dem Host bearbeiten und die Änderungen dann auf der Maschine pushen. Sobald Sie mit dem Ergebnis zufrieden sind, stoßen Sie das Deployment auf die weiteren Stages an. F: Ist die VirtualBox zwingend notwendig oder kann man das auch mit VMWare Workstation arbeiten? A: Wir benutzen für den Workshop das kostenfreie VirtualBox. VMWare Workstation unterstützen wir nicht. These instructions will guide you through an example project for the ‘Continuous Delivery’ workshop. Ensure that your USB port is working so that we can provide the image via a portable Hard Drive/Stick. SSH into the machine with vagrant ssh. You should be able to run every command that is needed for the workshop as user vagrant. You can use sudo without a password. Improve the application and push the updates, when you are satisfied with your results. You can edit the code directly on the host in your favourite editor / IDE. F: Do I really need VirtualBox or may I use VMWare Workstation as well? A: We are using VirtualBox for our workshop. VMWare Workstation is currently not supported. While working at a customer and I supported several teams. Every time I switched teams, I got a new ‘avatar’ on the Scrum board. It used to happen that Team One likes ‘southpark’ avatars whereas Team Two favours ‘The Simsons’. So I stralled hours through the internets to find my perfect avatar. Besides the fact that I do not watch nor favour any of those shows (seriously) I found the search totally annoying and a total waste of time. Some of them look quite similar and are hard to distinguish I often heard “Who’s assigned to this issue? Me? No, him!” Aaaarg! People got upset when I used an avatar that “didn’t fit” into the team’s schema. Ops life is hard enough. Stop make it more confusing with artificial, ridiculous cartoon avatars. Better use real photos and real names to communicate and to streamline communication. Getting things done faster is much more fun in my opinion than having cartoons on the wall. If you do like Avatars, I’d really like to hear your opinion on how they cheer you up. Hi there and welcome to my GitHub blog! I moved away from Posterous to GitHub pages because Posterous closes down end of April 2013. I decided against migrating old content to my new blog, because I felt like having a fresh start. These repos were inactive, orphaned, outdated and rather confusing than useful. Please update your forks and .git/config in order to use their original repos if you like to contribute. This is a brief comparison between librarian-chef an berkshelf to point out the main differences in managing cookbooks. Please refer to the offical announcement for berkshelf for a in-depth introduction / comparison for all features. I’m a big fan of librarian-chef and I currently use it in every chef-driven project. It helped my a lot taking back control when I got -confused- overwhelmed by cookbooks. Thanks to librarian-chef I finally could seperate my patched cookbooks, get rid of git-submodules in a sensible way with an easy to manage Cheffile that can be stored in version control. Everything was wunderbar! When I first heard of berkshelf via this blog post I got slightly confused: Is someone re-inventing the wheel here? It turned out that I should have read the offical announcement for berkshelf before posting my Tweet :) Hope this post helps you as well. librarian-chef will load all cookbooks defined in a Cheffile to a cookbooksfolder within the current directory. It also helps you keeping the cookbooks folder in shape by providing commands to show you outdated cookbooks etc. To do so it caches the checksums of theses files in a tmp folder within the current folder. I did not find a way to change the default “cookbooks” folder which can be a bit painful if you want a different folder strucuture. berkshelf (by default) loads all cookbooks from the Berksfile into one centralized repository in ~/.berkshelf (customize via BERKSHELF_PATH) and NOT into the current directory. After downloading all the cookbooks and their dependencies you can link those into whatever folder you like with berks install --shims your_desired_path. Default is cookbooks. Berkshelf creates hard links to cookbooks in the repository. You have to take care of outdated cookbooks etc. I’m very new to Berkshelf (just installed the gem, run the examples provided on their website) and yes it looks very promising. Berkshelf’s aproach with ONE repository that builds “the single source of truth” for all your chef-repos makes sense to me because these cookbooks should never change and kept away from your modifications. And Berkshelf does not spoil the repo with an “tmp” folder which confused some of my colleagues. Also the other features like “metadata” sound cool. Again: Please refer to the offical announcement for berkshelf for a in-depth introduction for all features. Although I found the installation of berkshelf a bit more complicated than librarian-chef (because of gecode) I will definitly dig deeper into Berkshelf. I’m very interested in your experiences with either of these tools. I switched from bash to zsh lately. After announcing it on Twitter I got lots of reactions, mostly questions, how I did get started. I decided to change my shell. Why? Actually I was like why not? Seeing a lovely bunch of hackers at the Vagrant Usergroup Berlin getting excited with tig (a Git browser on the shell) can have quite an influence - so I though: there’s got to be more than my standard shell! I added /usr/local/bin/zsh to /etc/shells Otherwise you won’t be able to activate the shell. After that I removed ~/.bash-it, followed the instructions https://github.com/robbyrussell/oh-my-zsh and customized my ~/.zshrc. Since then I do not regret it. I feel very comfortable with my new shell and I love the tiny little features it provides like auto-completion and correction. I didn’t dig into scripting yet though, so I can’t provide any feedback here but would love to hear your optinion on this.